The first academic degrees were all law degrees-and the first law degrees were doctorates. The foundations of the first universities in Europe were the glossators of the 11th century, which were schools of law. The first European university, that of Bologna, was founded as a school of law by four famous legal scholars in the 12th century who were students of the glossator school in that city. It is from this history that it is said that the first academic title of doctor applied to scholars of law. The degree and title were not applied to scholars of other disciplines until the 13th century. And at the University of Bologna from its founding in the 12th century until the end of the 20th century the only degree conferred was the doctorate, usually earned after five years of intensive study after secondary school. The rising of the doctor of philosophy to its present level is a modern novelty. At its origins, a doctorate was simply a qualification for a guild—that of teaching law. The University of Bologna served as the model for other law schools of the medieval age. While it was common for students of law to visit and study at schools in other countries, such was not the case with England because of the English rejection of Roman law (except for certain jurisdictions such as the Admiralty Court) and although the University of Oxford and University of Cambridge did teach canon law until the English Reformation, its importance was always superior to civil law in those institutions. In the medieval Islamic madrasahs, there was a doctorate in the Islamic law of the Sharia, called the ijazat attadris wa 'l-ifta' ("license to teach and issue legal opinions"). 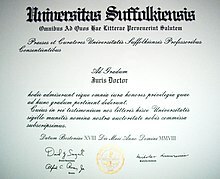 A typical Juris Doctor diploma from the United States, here from Suffolk University Law School in 2008. Bacharel em Direito (Bachelor of Laws) or Bacharel em Ciências Jurídicas e Sociais (Bachelor of Laws and Social Sciences), in Brazil, is an undergraduate degree. The abbreviation for Bachelor is Bel.. To be a Lawyer and be admitted at the Ordem dos Advogados do Brasil (Brazilian Bar Association), the Bachelor must be approved at the Brazilian Bar Exam, if the Selection and Registration Committee accept the new member he/she will be consider an Advogado (Attorney at Law/Advocate). Bachelor of Laws also referred to as a B.A. in Law (B.L.) or an LL.B. (Hons) in the United Kingdom and various current or former Commonwealth countries. It is an undergraduate degree. A Bachelor of Civil Law (B.C.L.) degree is similar in nature, historically distinguished from canon law. Master of Laws in the United Kingdom and various current or former Commonwealth countries. Also referred to as an LL.M. from its Latin name, Legum Magister. It is an advanced academic degree pursued by those holding a professional law degree or a degree in a relevant field. Laurea di Dottore in Giurisprudenza for graduates before the Bologna Process reforms, or Laurea Magistrale in Giurisprudenza after the Bologna Process reforms, in Italy. It is a masters level degree, however all graduates of Italian universities, even of the undergraduate degree, are authorized to use the title of "dottore" (Italian for doctor). Erstes Juristisches Staatsexamen is the equivalent to the law degree, since the second part (Zweites Juristisches Staatsexamen) is the German equivalent to the Bar exam in the U.S. At some universities you either become a "Lizentiat des Rechts (Licentiatus iuris)", a Magister iuris or a Diplom-Jurist. It is a master's-level degree. Juris Doctor (J.D.) in the United States and Japan (also offered at some schools in Canada, the United Kingdom, Australia, and Hong Kong). It is a professional doctorate degree. Legum Doctor (known as the LL.D., or in some jurisdictions Doctor of Laws) is in some jurisdictions the highest academic degree in law and is equivalent to a Ph.D., and in others is an honorary degree only. Doctor of Juridical Science (S.J.D.) is a research doctorate in law awarded mostly in the United States and Canada. Licenciado en Derecho ("Licentiate in Law") in Spain. Licenciatura en Derecho ("Bachelor in Law") in Mexico. Lizentiat der Rechtswissenschaften (German) / Licence en droit (French) until 2004 and Master of Law (MLaw) since 2004 (as a result of the Bologna Process) in Switzerland. It is a masters level degree. Magister iuris (Mag. iur.) ("Master of Law") in Austria and Croatia. It is a masters level degree and the first academic title within both systems. After three years of practice you can take the "Anwaltsprüfung" (in Austria) or "Pravosudni ispit" (in Croatia), an equivalent of the bar exam. Specialist in law or Jurist in Ukraine and Russia. It is a graduate degree which allows doing a PhD research after admission to the PhD department (aspirantura), though formally it is not at the masters level. The Finnish title of varatuomari is the basic qualification for the legal profession. It is obtained by an one-year externship at a district court after completing a Master's degree in law in a university. ^ "Becoming a Solicitor". The Law Society (UK). Retrieved 2009-01-04. ^ "Solicitor's Regulation Authority Student and Training information". Solicitor's Regulation Authority. Retrieved 2009-01-04. ^ "How to Become a Barrister". The Bar Council (UK). Archived from the original on December 18, 2008. Retrieved 2009-01-04. ^ Reed, A. (1921). "Training for the Public Profession of the Law, Carnegie Foundation for the Advancement of Teaching, Bulletin 15." Boston: Merrymount Press. ^ van Ditzhuyzen, R. (2005). The 'creatio doctoris': Diversity or convergence of ceremonial forms? Unknown publisher. Accessed May 26, 2008. ^ Makdisi, G. (1989). "Scholasticism and Humanism in Classical Islam and the Christian West," Journal of the American Oriental Society 109, 2, pp. 175–182. ^ John H. Langbein, “Scholarly and Professional Objectives in Legal Education: American Trends and English Comparisons,” Pressing Problems in the Law, Volume 2: What are Law Schools For?, Oxford University Press, 1996. ^ See University of Ferrarra. Faculty of Law (in Italian). Accessed January 5, 2008. ^ Association of American Universities Data Exchange. Glossary of Terms for Graduate Education Archived 2009-03-04 at the Wayback Machine. Accessed May 26, 2008; National Science Foundation (2006). "Time to Degree of U.S. Research Doctorate Recipients Archived 2016-03-08 at the Wayback Machine," "InfoBrief, Science Resource Statistics" NSF 06-312, 2006, p. 7. (under "Data notes" mentions that the J.D. is a professional doctorate); San Diego County Bar Association (1969). "Ethics Opinion 1969-5". Accessed May 26, 2008. (under "other references" discusses differences between academic and professional doctorate, and statement that the J.D. is a professional doctorate); University of Utah (2006). University of Utah – The Graduate School – Graduate Handbook Archived 2008-06-26 at the Wayback Machine. Accessed May 28, 2008. (the J.D. degree is listed under doctorate degrees); German Federal Ministry of Education. "U.S. Higher Education / Evaluation of the Almanac Chronicle of Higher Education" Archived 2008-04-13 at the Wayback Machine (in German). Accessed May 26, 2008. (report by the German Federal Ministry of Education analysing the Chronicle of Higher Education from the U.S. and stating that the J.D. is a professional doctorate); Encyclopædia Britannica. (2002). "Encyclopædia Britannica", 3:962:1a. (the J.D. is listed among other doctorate degrees). ^ Julia Pogodina and Ruslan Sadovnikov. Legal Education and Legal Careers in Russia Archived 2009-03-26 at the Wayback Machine. Northwestern University School of Law, Career Center. Accessed January 7, 2009. This page was last edited on 27 December 2018, at 16:16 (UTC).